Look for studio-created works under this heading. Because this is mostly a “Sketching Blog”, designed to teach and inspire, i’ll be posting sketches and preliminary works involved in creating finished studio paintings. 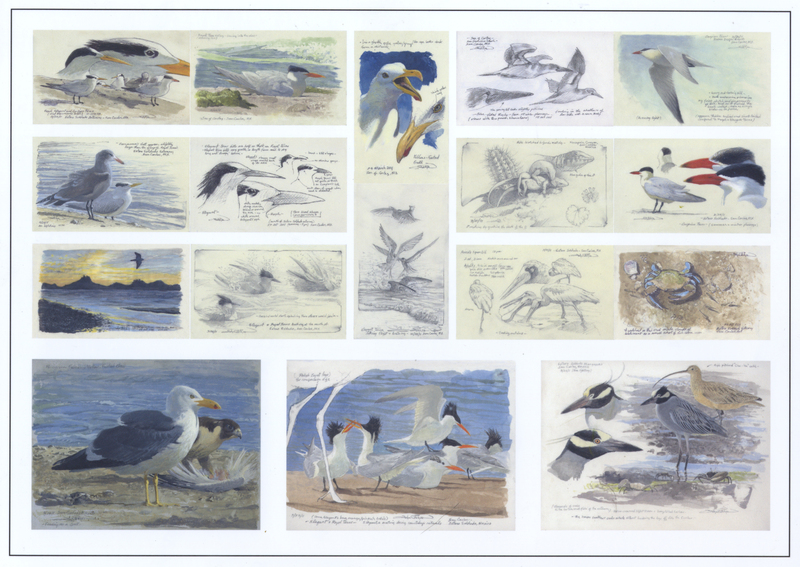 In my post “SEA of CORTEZ EXPEDITION” you’ll find many of the field sketches I created in preparation for “The Gathering”. While exploring and recording nature into field journals is one of the best parts of my job as an artist/naturalist, it is just the beginning of a long creative process; back in the studio is where the real work begins. I’m always appreciative and fascinated when other artists share the development of their paintings, so I too am sharing some photo progressions of this painting that illustrate a few of the techniques I used to meet the challenges of this composition. Keeping a field journal and making life sketches is my way of “settling in” to an area. At the time of execution, I don’t think of my sketches as being “preliminary” to a future painting, I’m simply recording something of interest to me at the time. Through such focused observations I slowly create an information base. The photographs I take on location are also an important part of this “information base”, used mainly back in the studio they serve a different purpose. After spending some time on location, watching, sketching and recording, I start to get ideas for studio paintings. If you have read my post on SKETCHING PRACTICE STRATEGIES you may remember I always carry a small notebook/sketchbook with me, this is where I usually start to put down ideas for larger works. I just make quick concept drawings, often writing down what excites me about an idea. I will talk more about the value of “field Thumbnails” later, right now I want to get on to the studio! My wife, Sue Westin (also a professional artist), and I call it the barn studio because it used to be an old barn in New York state. It was built sometime before 1875 based on the rafter design. We bought it and had it taken apart and reassembled on our property. We kept the slate roof, insulated it, put new board & batten on the outside and the old outside boards on the inside! Of course we added the north light windows and the patio door. In addition to our studios we also have a personal gallery on the property called Gallery on the Marsh. Check out this link to take a quick tour of the gallery. This is the basic set-up I use when working on large paintings. My easels, palette cabinets and layout tables are either on wheels or portable, making it easy to work out different working arrangements. The ledge in front of the painting can accommodate a small portable palette but it usually holds reference material. I like a large palette to my right and the canvas vertical. This dark glass palette is what I use for oils – pay no attention to the Long-billed Curlew (painted in gouache), that’s just me being distracted. By now you’re wondering about the color charts on the table. May I suggest you follow this blog to learn more about these later, but for now just know that I created them years ago, based on my palette colors at that time, and use them as a guide to different color mixtures. Don’t think that I keep them spread out like this all the time – they’re usually stacked on a table. As you can see I like to keep my studio rather clean-looking, but don’t think for a minute it stays this way during a painting session – I have a fetish about making a mess on top of a mess! Once I’m back in the studio I review my field studies, field thumbs and location photos to work up small studio thumbnail sketches, without being too concerned about proportional accuracy. I ‘ll draw up a few ideas and run them by my wife, Sue, (always a good idea) to help decide which one to do. If none of them pass the “Sue test” then I review my base information again and sketch out more ideas. If they still don’t pass inspection then Sue is dropped from the equation and I proceed with fear and trepidation! This stage is the most important one of the design process because now I figure out the abstract quality of the design and 90% of the proportional and perspective elements. I did something different on this project. I always make high resolution scans of all my works so I decided to try using Adobe Photoshop to cut out the field sketches I planned to use in the design, then placed them into Adobe Illustrator to arrange them within the 3 x 5 proportional rectangle. In these Adobe applications I could enlarge or reduce each image separately, allowing me to “quickly” (it took me a long time) establish size relationships. 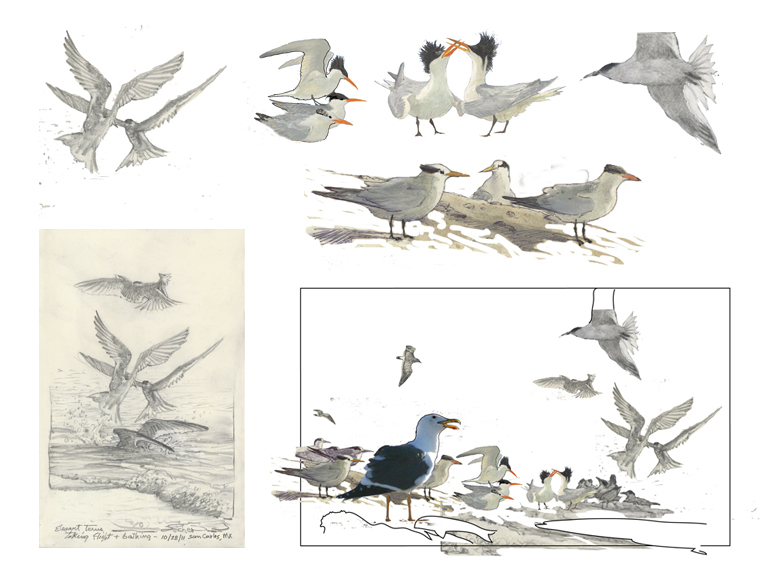 Because I didn’t have a sketch of the Yellow-footed Gull in the position I wanted I inserted one of my photos to give me a proportional comparison to the terns. I’ve only used this digital method once before, for a commercial job, so it probably took me longer than if I had just drawn them out using layout or tracing paper and a light table, which is what I usually do. I would normally print this final design out onto a letter-size heavy card stock and then experimentally paint up different color renditions. This is a good idea if you are not sure what color combinations you want to use. It is much easier to work out the color problems on a small-scale then to waste time and paint on a large-scale. Because this painting was painted under a deadline I went directly to the canvas. The design was then transferred to a medium gray tinted three by five foot linen canvas, the main elements roughly sketched in with graphite. 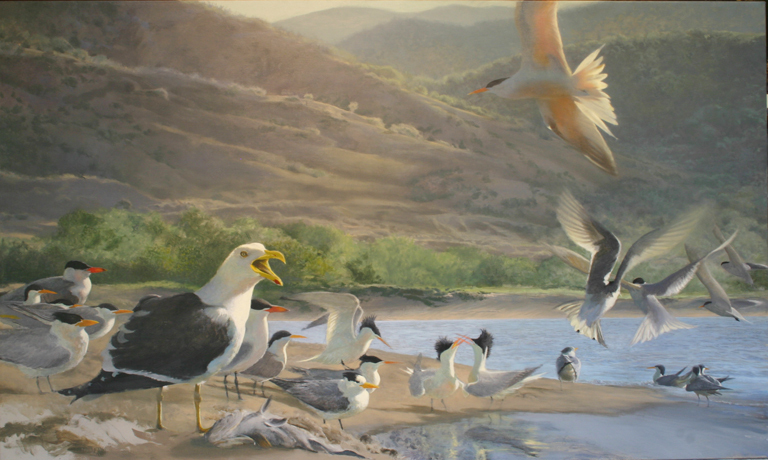 How I start a painting varies from work to work , with this one, I first established the lightest white and darkest dark then blocked in the foreground birds using thin acrylic paint. 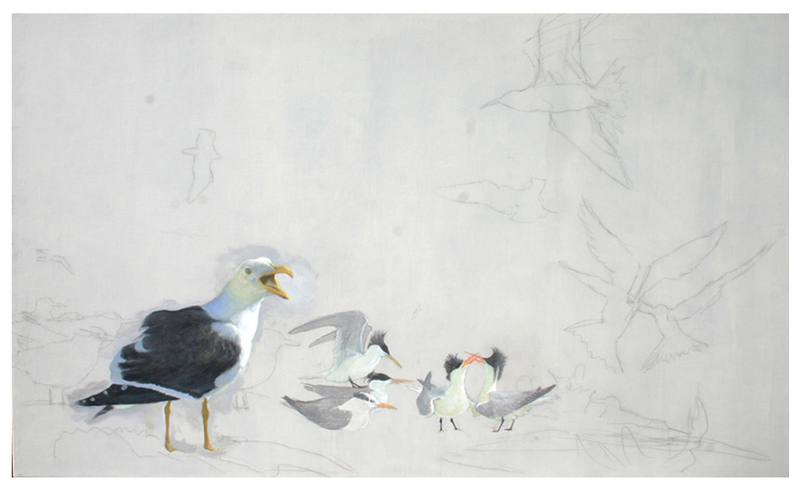 I knew the head on the gull didn’t show the action I was looking for so I used one of my studies of a protesting gull to change the head, drawing it in graphite and using acrylic and grayed gesso to help shape it. 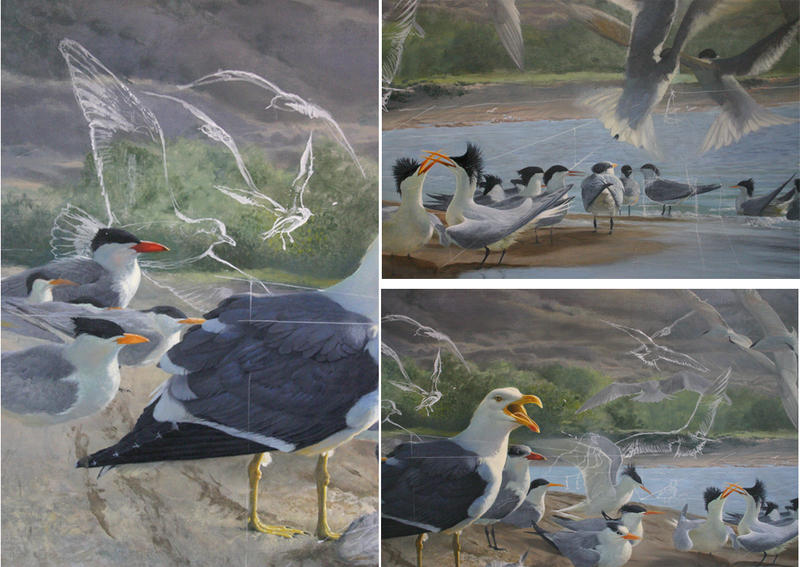 Still using acrylic I continued to block in the rest of picture, adding more birds and the shape of the sand bass the gull is claiming. This helps to establishing a base color to build upon. At this stage I switched from acrylic to water-soluble oils. 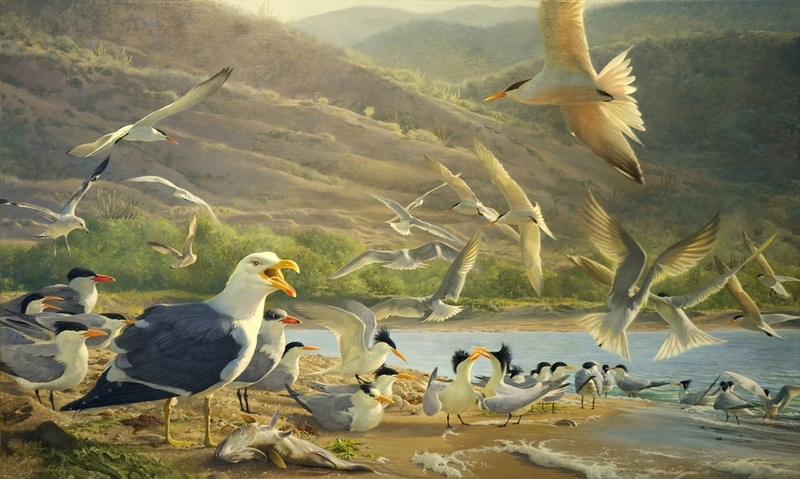 I then added more birds and cranked up the saturation using a combination of opaque painting and translucent glazes. By slowly building up the colors and values I was better able to see where the painting was leading me and make any needed adjustments. From the very beginning I wanted to work some bathing terns into the design, that’s why I left a pool of water in the foreground. So, I decided to paint an Elegant Tern springing up from the water. I knew if I painted it in oil, using my fast drying medium, it would be hard to remove or change later once it sets up . My solution was to paint it in gouache (opaque watercolor). As it turned out it didn’t seem to work well within the composition so I easily wiped it off with water. Part of my process of figuring out where I wanted to put the birds in flight, was to cut out “paper dolls” and move them around within the composition to find their place. Having figured out where I want the birds in flight, I then painted them free-hand using white gouache. Look closely and you might see perspective lines drawn in white chalk which helped me determine the relative size of the birds on the ground ( birds in the air may be any size you want – more on that later). 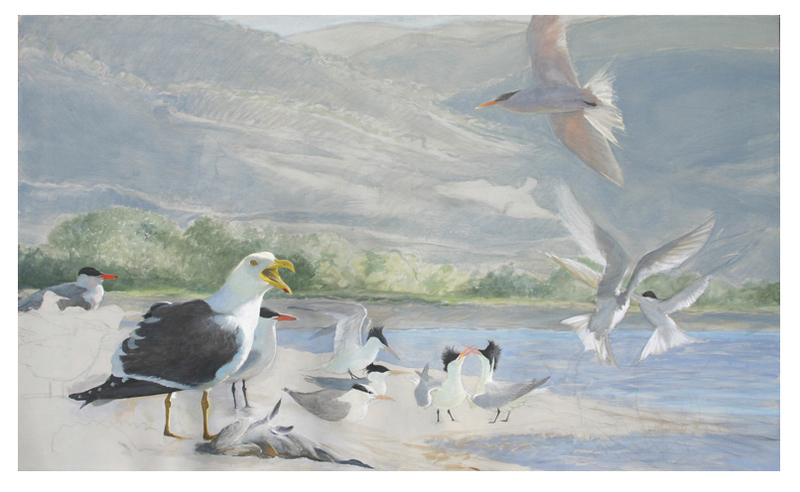 The large flying Ring-billed Gull in the left panel was eventually wiped out and is not part of the final design. Making changes is all part of the creative process. 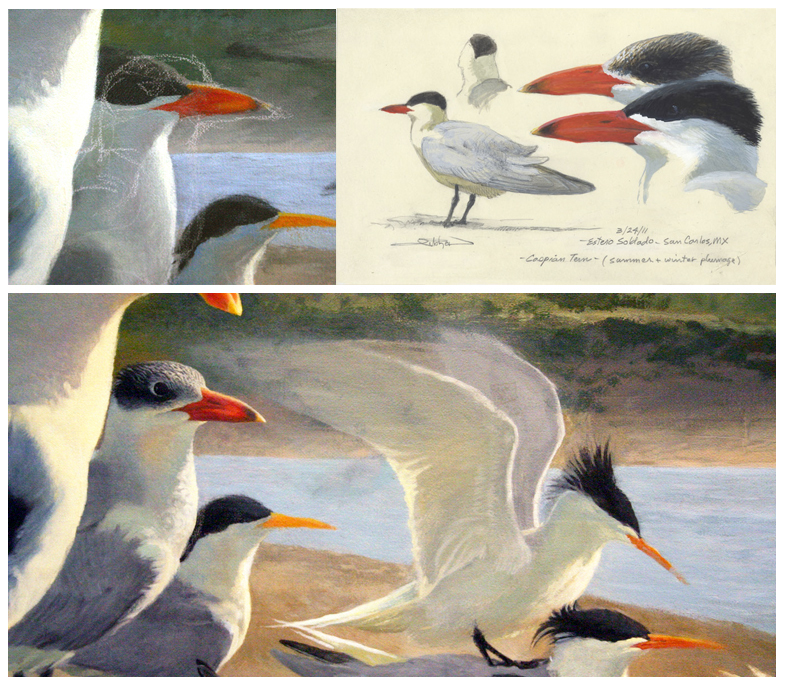 Using white chalk , I decided to re-draw the head of this Caspian Tern to a more pleasing angle and to change its adult breeding “black cap” to a nonbreeding plumage pattern as observed in my field study. 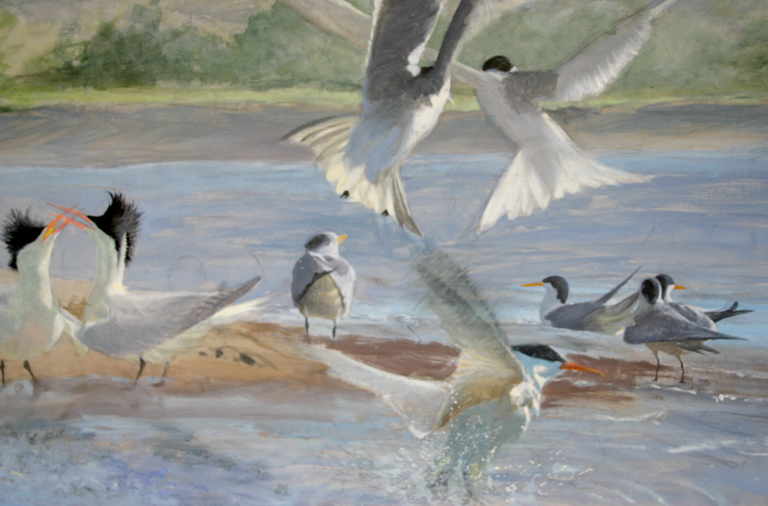 I also re-shaped and blurred the tern’s wing to add action and lessen the tension around the newly painted tern head. 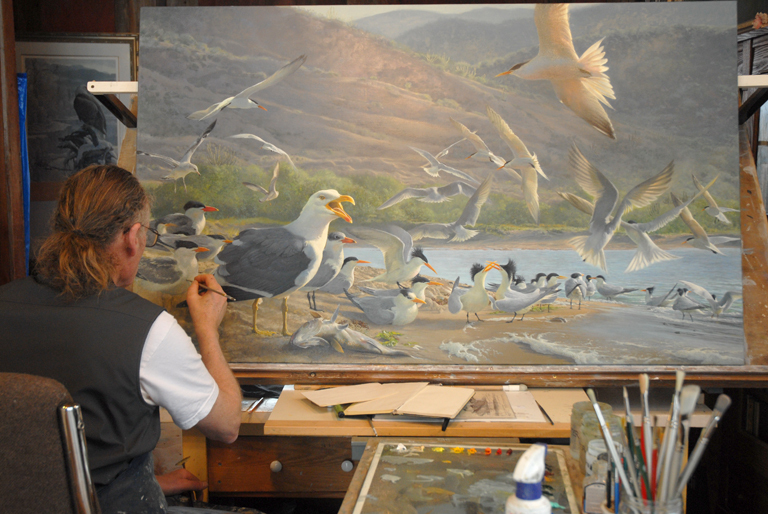 With all the elements painted in the work is nearly finished, just a few more birds to refine before signing! 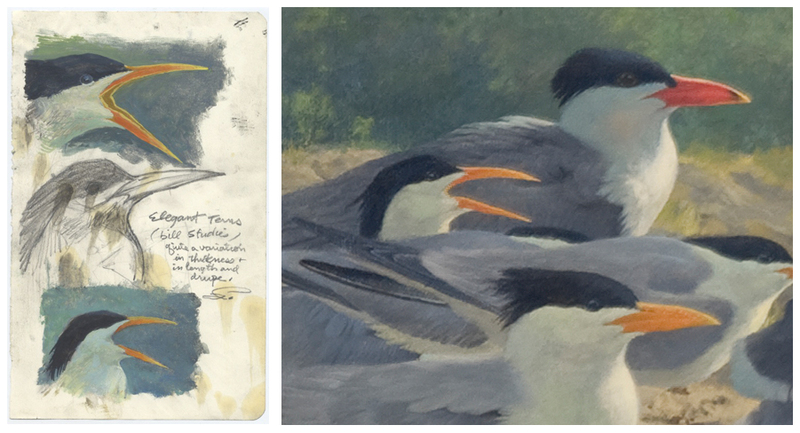 One last change – I opened the bill of the Elegant Tern, then finished the foreground birds. Signed and sealed – with retouch varnish for exhibition then six months later with a final varnish. To inquire about the availability of any sketch or painting posted please contact me directly.